SponsoredSeeking to bring a little modernity into your period bathroom, or add a few beautiful design elements that really bring the room to life? Here are 5 tips for bringing a modern look to your period home bathroom. Choose furniture which complements the style, but can hold its own. Whilst the very traditional ‘basin and jug’ look might be a classic nod to the history of your home , look for something that enhances the original aesthetic without disappearing into it. A stand out piece can take your design a step beyond; either look for something that pops against your colour scheme or something with a unique style that is unexpectedly beautiful. Amp up your lighting. Take it to the next level with small but uniquely creative pieces, or choose a dramatic piece that will complement the room’s style. If you have a lot of space or height then an overhead piece can be a perfect feature. If you are a little more limited but would still like to enhance your lighting then look for smaller but still stylish lighting pops. Not only do they brighten the room, but they are a sleek form of decoration that doesn’t make the space too busy. Choose a freestanding tub with a unique look. Clawfoot tubs are go-to piece for period bathrooms and they are a timeless classic, making them a great investment piece. 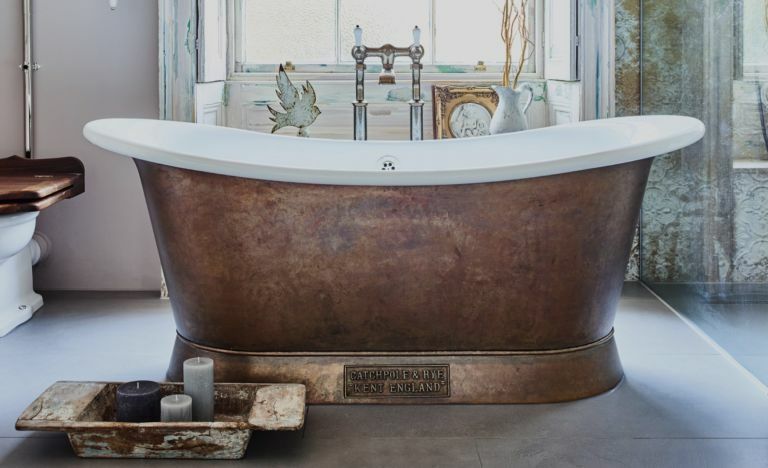 There are some really exciting new varieties of freestanding bathtub so whether you love the claw foot or want something slightly different, you can find a serious show stopper that draws on modern design inspiration. Deep royal flushes across the walls can be beautiful with a splash of marble and silver nickel. Or commit to the metallic tones and mix up your metals – drawing in a touch of metallic can add a dose of glamour to any room! Looking for a quick fix? Painted furniture is having a moment and can be a great way to dress up pieces without committing to a full room look. Not a colour fan? Simply mix up your neutrals - Consider changing up the oak beams and white wall aesthetic for a Scandi Noir look. The sleek greys and clean navy/black colour schemes can work wonders in traditional spaces, modernising without ‘overdosing’. Beams can be transformed with a lick of dark paint for a whole new look. If you have beautiful features, you can even go as far as stripping back entirely to a clean white; allow the pieces to speak for themselves.